On Tuesday, members of the Texas volleyball team showed up for a practice in Gregory Gym in their Halloween costume. Morgan Johnson, Riley Fisbeck, Blair Westerlund and Katarina Luketic dressed like Longhorns from different athletic programs. Freshmen Logan Eggleston and Sydney Petersen channeled their inner-superheroes, while junior Autumn Rounsaville went as the season she shares a name with. Even Texas coach Jerritt Elliott wore a lemur costume. Jhenna Gabriel practiced as a giraffe, but she returned to Gregory Gym the next day as a back-up quarterback with a Hollywood ending. A freshman setter, Gabriel came off the bench to lead UT to a 25-13, 20-25, 25-17, 25-23 victory over TCU. The Wednesday win was the fifth straight in conference play for Texas, the sixth-ranked team in the AVCA’s national poll. Texas opened Wednesday’s action with an attacking error, but the next seven points — and the first set — belonged to the Longhorns. Texas hit .158 during a second-set slump, which extended into the third session. After falling behind 7-5, Elliott pulled sophomore setter Ashley Shook, a captain and two-year starter, in favor of Gabriel, who he said had practiced well on Tuesday. UT responded to the line-up change and eventually went on a 12-2 run with Gabriel guiding the offense. Gabriel contributed six assists and two digs during the third set. Her highlight-reel backset for a Yaazie Bedart-Ghani kill gave UT a 16-12 lead. Shook will be UT’s starting setter in its next match, but Elliott said, “we’re glad that we have Jhenna as part of this program to be able to do that for us.” Wednesday night belonged to Gabriel. Recruited out of Hawaii, Gabriel had primarily been used this season as a relief option on the service line. Gabriel had only seven assists over UT’s first 18 matches, but she collected 22 on Halloween. Texas was hitting .165 when Gabriel took over, but that number increased to .258 by the match’s end. In addition to Gabriel, Texas was led by junior Micaya White’s 17 kills. Bedart-Ghani contributed 14 kills on 25 attempts, and freshman Brionne Butler had eight blocks. With five matches to go in the regular season, Texas (15-4; 10-1 Big 12) has two fewer losses in conference play than second-place Kansas (14-7; 7-3). Kansas beat UT on Oct. 10, but the Jayhawks must still travel to Austin next Saturday. 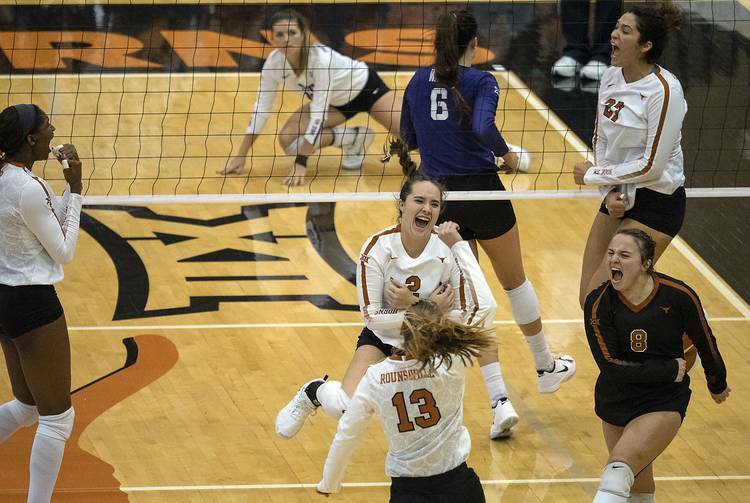 That championship-caliber clash in Gregory Gym will be preceded by UT’s home match against Kansas State on Wednesday. TCU (12-10; 4-7) was led by middle blocker Anna Walsh’s 13 kills. The Horned Frogs dropped to 1-16 in their all-time series with Texas. TCU has never won a match in Austin.